Are you looking to start, build, or grow a counseling practice? Are you struggling to get off the ground and build a caseload of counseling practice? Are you thinking about converting a successful solo practice into a larger group or agency? In this video program you’ll learn everything you need to be successful in private counseling practice. We’ll guide you from before you open your doors, to the day you open your doors, to 5 years after. Whether you’re looking to build a lucrative solo practice, or a larger group practice that makes over a million dollars a year, this program is for you. We haven’t done it just once–we’ve done it over and over and now we want to teach you. In addition to video lessons, you’ll get interaction with the Thriveworks team in our live discussion groups. Ask questions, comment, and even contribute your own experience. 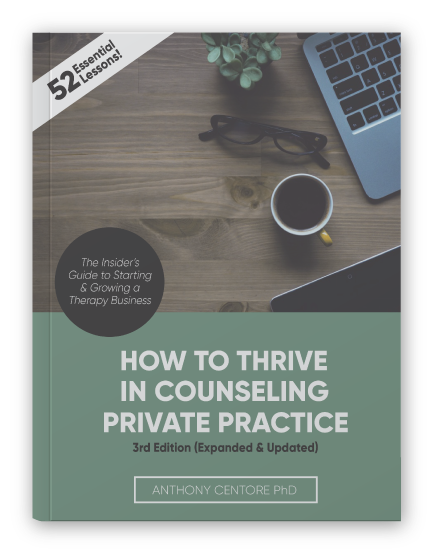 Sign up now and get a free e-Copy of our flagship textbook, “How to Thrive in Counseling Private Practice,” an $89 value. Meet Mike. Mike is a counselor and has always wanted to have his own counseling practice. Like anyone getting started, Mike wants to make sure that he hits the mark and builds a successful practice. However, like many, Mike is overwhelmed with the enormity of starting a new business. From practice management, to marketing, to hiring help, Mike can tell that it will take him years to learn everything he needs to know; and the potential mistakes could cost him financially. Then, Mike hears about Thriveworks’ counseling franchise. 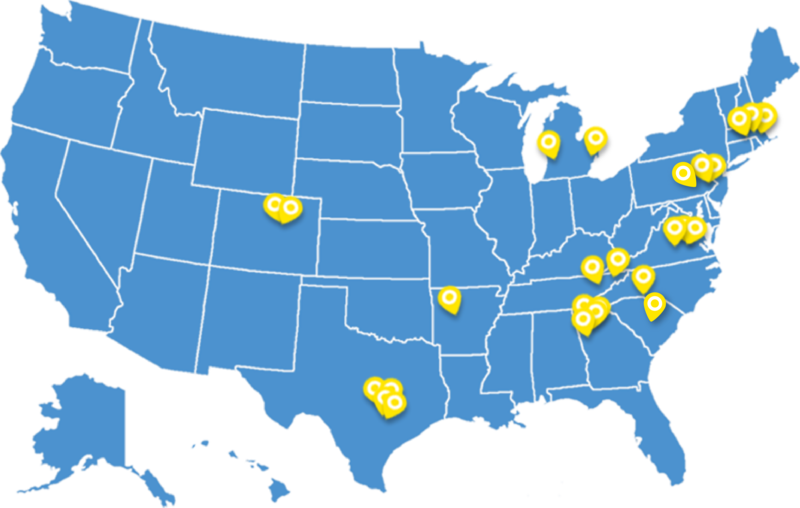 Thriveworks is a chain of counseling practices with over 30 locations. 1. A Proven and Successful Business Model. 2. Operations Support, Including Scheduling, Medical Billing, Website Promotion, And More. 3. A Strong Brand Message, Mission, and Online Presence. With Thriveworks, you’re never on your own. From the support from the team at Thriveworks HQ, to it’s active franchisee community. With Thriveworks on your side, You have more time to focus on your clients and building your clinical team. You’ll experience start-up and ongoing training, and continual support from your Thriveworks team. With Thriveworks behind him, Mike is no longer on his own, and his practice is “thriving”. Here’s how to get started: IT’s easy. Contact us for more information, learn the steps and apply to OPEN your franchise. To learn more, call us at 1-855-4-THRIVE or go online to thriveworks.com/counseling-franchise. Thriveworks Counseling and Life Coaching is now Franchising in 40 States. Thriveworks now offers well-qualified applicants the opportunity to own a Thriveworks Counseling and Life Coaching center. Thriveworks® is excited to announce that we are in the process of Franchising! This means that our plan is to begin offering Thriveworks Counseling Franchises at some point this summer. To date, there is no franchise opportunity for counseling, psychotherapy, or mental health. But when we finish the franchising process, counselors will be able to operate their own Thriveworks Counseling practices! Can you give me all the details? We cannot! Franchising is a very regulated process, and we’re legally limited as to what we can reveal until all our paperwork is approved by the right government departments. After the process of franchising is completed, we will be able to announce more details. Why would someone want to own a counseling franchise? That’s a great question. 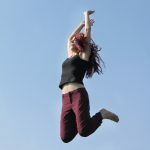 We can only speak in generalities at this point, but hypothetically a counseling franchise could allow clinicians to focus more on what they love (seeing clients) and less on developing business operations. In general, a franchise is supposed to be a turn-key business, which means a franchisee won’t need to “re-invent the wheel.” Often, with many franchises, the franchisees also benefit from ongoing business support. If you are interested in starting your own Thriveworks franchise, continue checking back. We hope to be able to release more details soon! You can also send us your contact information, and we will keep you updated with new information! As counselors, when we venture into private practice for the first time, we make the difficult transition from technician to entrepreneur. The immensity of this transition cannot be overstated. (1) How to build a profitable practice will little or no upfront money. (2) How to market your practice, so that you build a full caseload quickly. (3) How to price your services, so that you earn the money you need to live the lifestyle you want. (4) how to… Oh heck, why don’t I just show you the Table of Contents!? …. Lesson 2: Should I Start a Private Practice? Lesson 5: How Much Money Can I make in Private Practice? Lesson 12: Why the Life Coach is Eating the Counselor’s Lunch! Lesson 21: Should I Grow my Solo Practice into a Group Practice? To help healthcare providers improve their medical billing collections, Thriveworks recently launched a website dedicated specifically to provider medical billing. The website, which provides information on Thriveworks’ professional billing service, also provides over 20 articles, and a growing library of billing videos, providing tips for DIY medical billing. Visit the site here: Medical Billing. Thriveworks is planning to launch it’s third counseling location, in 2012, in Richmond, Virginia. This recent announcement came on the heals of the opening of their second location, in Philadelphia, PA, in January of this year. While an official address has not been announced, a website provides details and a general overview of the new practice. The new Richmond counseling office is expected to open for business this spring. For your counseling practice, your medical billing team can be a huge strength and asset, or a nightmare. Too often it is poor billing processes that destroy therapy practices. Consider these 3 questions. Question Number One: Are you receiving payment for your claims? Obviously, the point of medical billing is to get paid for your work. But what is reasonable to expect? A: You are doing well if you receive between 96 to 99 percent of claims, or better said, percentage of money from claims. I make this distinction because if you’re billing for different services, and you’re getting paid on your small claims, but not your high-fee claims, you could potentially have a high percentage of claims paid, but a lower percentage of total money in the door. A quick note: having 100% of claims paid is always what you’re aiming for–that would be ideal. But in the imperfect system you’re working with (healthcare), be satisfied if you’re receiving 98%. If you’re at 94%, don’t panic, but its time to look closely at your reports, and determine where you’re losing 6%, so that you can make changes. I have profiles on Youtube, Twitter, LinkedIn, Digg, Reddit, Technorati, Ning, Squidoo, XING, Yahoo Answers, MySpace, Yedda, Furl, Blogger, WordPress, StumbleUpon, del.icio.us, Yelp, Knol, Facebook, Orkut, Foursquare, and Skype… to name a few. Most of these accounts I hardly use. Several I’ve been on once to create the account and only remember them when I receive email newsletters, which I unceremoniously delete. And, now that I’m thinking of it, a few of the above sites might be defunct by now. Students and colleagues have been finding me online for several years, so I’m used to getting the occasional “friend request” from someone I have taught or worked with. However, more and more often I am receiving social networking requests from clients—either my own, or from clients of other providers at Thrive Boston Counseling. This poses some clinical and ethical considerations.